ChahDresh ponders Initiative (the new Pilot Skill) and Turn Order (the new Initiative) in X-Wing 2.0. I tried. I really did! I tried to keep at least some attention on X-Wing 1.0. Yes, yes, I did my share of speculation and calculation, but I also made an effort to balance that with 1.0-focused topics. Well, barring some Store Championship-themed stuff, that may be at an end. There is SO MUCH to talk about with 2.0, with spoilers and rules and things dropping on us full Force, that it’s going to be swamping my output for the foreseeable future. It is what it is. Hey, Kylo, what’s my line? That’s the one. Let’s do this. First up: a treatise on Pilot Skill/Initiative. I’ve talked about pilot skill before. It’s an enduringly interesting topic. Compared to, say, your agility or your attack, PS is highly volatile: it varies widely within ship classes as well as across ships. It’s binary (you are/are not higher), yet at the same time highly contextual. That means its importance, and which values are important, is always in flux. And it’s never been in more flux than with the release of 2.0—flux so severe they even changed the name to “initiative”. The shakeup, simply put, is: one third of the pilot skill steps are getting chopped out. Whereas today PS varies from 1 to 9 (and with upgrades can reach as high as 11), in 2.0 initiative will range only from 1-6 and can’t be increased. It looks a lot like a normal distribution, doesn’t it? Most of the action is in the middle, between five and seven. You have a small number of types of pilots with super-low PS because the super-low PS pilots are generally generic and, in theory, you’d see them in higher numbers of total ships even with fewer pilots. At the high end, PS9 is rare, but PS8 is relatively common; most ships have a top-end pilot at either 7 or 8. Yes, we could do a more detailed review of this, ship-by-ship, and yes, the Auzituck and TIE Defender are dominated by their middleweight pilots and they’re some of the more common ships on tables. Even so, the point is very clear: for all the mid-PS pilots in the game, relatively few of them are played. 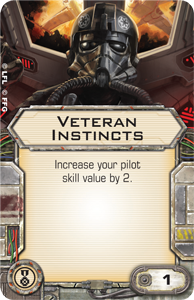 The corollary: VI doesn’t show up on pilots until 7, after which it is perhaps the most common EPT of all. As I’ve detailed before, the intensity of this phenomenon waxes and wanes with the PS of meta-dominant ships. That’s not necessarily a bad thing. What it means, though, is that a large portion of the PS range places no value on its PS. 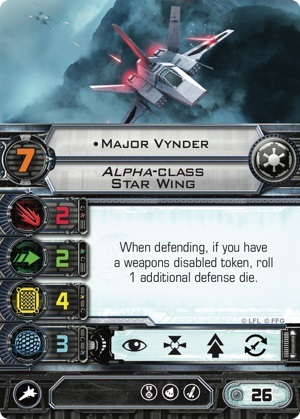 There is, for example, virtually no advantage to taking a Glaive Squadron Pilot over Countess Ryad. The tradeoff in this case is Ryad’s potent pilot ability for one point of PS. If that point of PS were from, say, 7 to 8, that would be a significant trade; going from 5 to 6, by contrast, makes it a no-brainer. Why, though? Two factors. Arc dodgers are disproportionately dependent upon PS advantage; losing PS advantage has a near-binary effect on their viability. (One Worlds player scraped up six Swiss wins with Kylo Ren, Quickdraw, and a 9 point initiative bid. 9! That might be a record for that level of competition.) Alpha strikers have a similar dynamic. These types of ship ensure there is always some upwards pressure on PS. More broadly, when the dominant pilots for each ship reside at the top of the PS scale, it shifts what the bell curve looks like. You don’t care about being able to out-PS, say, that one guy running Hobbie Klivian and his mighty PS5; you care about scooping the fifty people running Miranda. It’s instructive to remember what was happening back in the so-called Jurassic Park era of X-Wing. There was PS competition at the very bottom of the bucket, with PS1 Academies being stuffed by PS2 Blue Squadron Pilots, who in turn were trumped by PS3 Obsidian Squadron Pilots, who in turn lost out to Tala and Dagger Squadron Pilots. These archetypes—that is, these low-PS swarm lists—were common enough that upping your PS to 3 or 4 could prove a substantial advantage. Sure, it was wasted against aces, but that’s how meta plays work, and those are acceptable trades thoughtful players can choose. Swarms, as we all know, are in abeyance; mid-PS ships are mostly brought for utility rather than firepower and, in any event, have no prayer of hanging with the logjam at high PS; those factors are producing upward pressure on PS and, as a result, further reducing the importance of PS below 7. VI is part of the problem, and it has long been a design limitation for the game. Whisper is exhibit A. FFG couldn’t make Whisper higher than PS7 because VI exists; PS 10 or 11 Whisper would have been even more ridiculous than she ended up being. However, Whisper’s an arc dodger, so she cares disproportionately about PS, and 7 was too low for what she needed to do. That meant she *had* to take VI to function. (An alternative might have been to make her PS9 and deny her an EPT slot, but that doesn’t feel good.) That, in turn, meant that the other things ships need—like action economy—had to be satisfied from other slots, which is why the Phantom ended up with crew and systems slots despite its miniscule size. The existence of VI and the importance of PS at the high ends imposed design choices on the developers. That hasn’t gone away, either. What about this guy? There are two things FFG decided to do to address these phenomena. First: we don’t see Veteran Instincts anywhere. Good riddance. Second: the consolidation of PS from 9 (or 11) buckets to 6. I would argue that the balance adjustments to ships also indirectly affect PS a great deal: if more ships at mid-initiative are powerful enough to hold their own, and they see more play, there’s more profit in paying a premium to out-initiative them. More ships are in each bucket, meaning that each point of PS that you buy lets you beat a larger portion of the pool. As in today’s game, this is subject to meta effects (maybe not that many Ini4 ships see play? ); but the greater compression basically ensures a greater value for each point that you buy. This is especially true because the compression is even larger than it first appears. Ini6 is being made rarer, and thus more special. Soontir Fel will move last. Wedge will shoot first. No one is coming in after them regardless of upgrades. The downgrading of Talonbane and the (temporary) absence of the PS9 pilots from New Trilogy ships dramatically thin the pool of Ini6 ships. (Two Imperials, two Scum, and three Rebels—cue faction favoritism jokes!) With less competition, these ships have a greater advantage. Sure, we’ve seen a couple of effects that allow ships to shoot at higher Ini. That’s still a big difference from the existence of VI, and it won’t help so-equipped ships keep the top aces in arc. It’s also being made more expensive. Reasonably-equipped Luke is 3 threat; similarly-equipped Vader is 4. 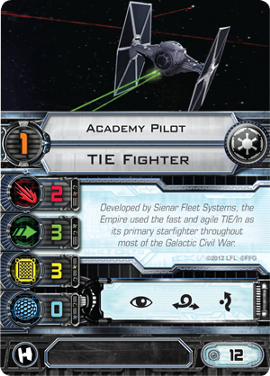 Keep in mind that an Academy Pilot is one threat and a typical game is 8; that implies that Vader’s cost in today’s points would be in the 44-56 range. Vader and Soontir would be almost your whole list—but they’d be darn sure to be going after the enemy. Don’t get blocked. Ini1 remains uncommon. Despite compression, Ini1 is still reserved for the very bottom of the barrel, only the very cheapest ships. Academy TIEs, Bandit and Binayre Zs, Phoenix As, things like that. Practically speaking, this means that virtually all the game’s pilots are now compressed into only four buckets (Ini2-5). This greatly increases the number you scoop with every point of Initiative you buy. This is doubly so since Ini5 is more restrictive than you might otherwise expect. More than a few PS8 pilots got demoted to Ini4, and only a few PS7 ships got the bump up to Ini5 (Whisper, perhaps predictably, and Dash, rather less so). The punchline, then: prepare to have to ponder your ships’ initiative values to a higher degree, because it WILL matter. Related: prepare for Player Order bids to become similarly important and pondered, because overlap is now more likely. I do believe there’s room for one PS-affecting EPT: Adaptability (minus). 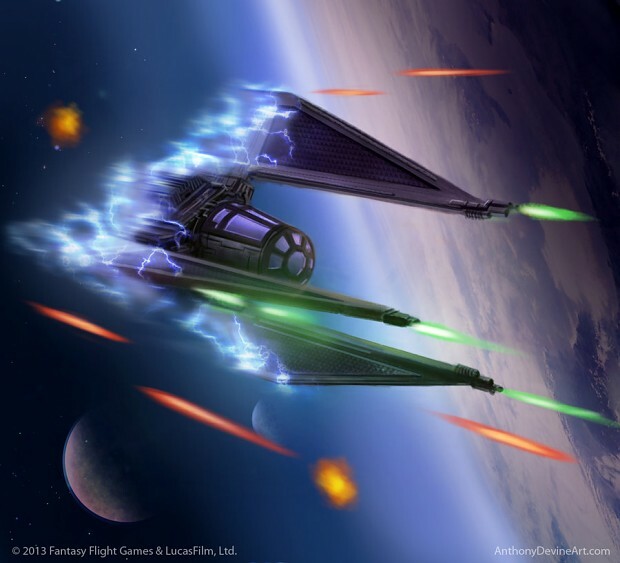 There are corner cases and specific ships where dropping in Initiative is advantageous: to enable certain combos, or allow ships to activate at the same time, or take advantage of blocking. I think that design space is still open. Want to talk about open design space? Try the EPT-slot for high PS ships. Can you even imagine Whisper without Veteran Instincts? It’s time to start imagining, because that’s happening. All the high-end ships that have to seriously weigh the opportunity costs of Veteran Instincts are now free from its tyranny. Vynder with Saturation Salvo, anyone? So! That was an awful lot of words. Next time, we’ll revisit this topic… but with the power of GRAPHS.